One of the most promising patch ever. My hopes are restored. I bet what you want to that this image is from the bestiary book Norsca. Was hoping for a new race. Was hoping they add a fimir matriarch as a new lord for norsca, but glad to see they are adding new monster hunts. Currently in early pre-production, it is dark and quiet in this team’s corner of the studio. Visitors do not dally long. 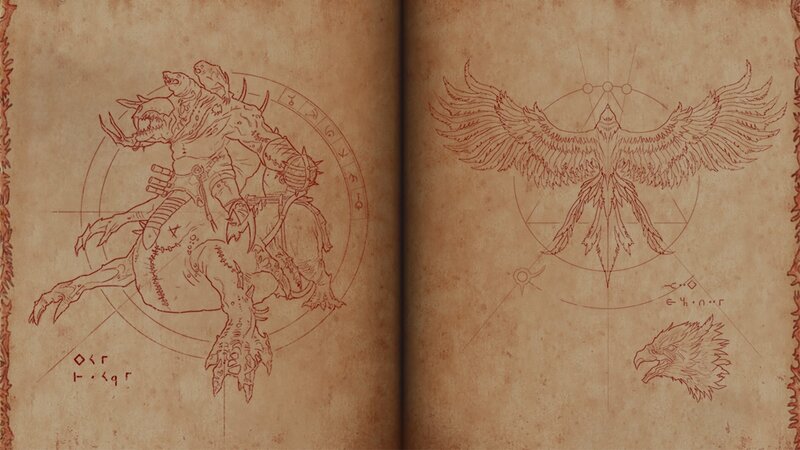 Also what @corvo those look like bestiary entries for sure. Does it mean a new campaign pack is under development for Rome 2? Sadly no hint when it will be released. Thanks a lot for the update. So we get a gobbo and a dwarf? Just kidding. I´ll keep my fingers crossed for more Cult of Khaine units then. dark and quiet = space in my mind. Chaos isn't really quiet. Just want the Lord Packs asap----> they gave us one in May with Norsca. I said that this summer will be promising boys. After the two Lord Packs... Unleash the Dogs of War and Make Araby Great Again! "CA will not make eastern world because is a dark lore and not talked about." Possibly a hint, or that they've cut the power to those section of the office and the desks are all eerily empty. Move swiftly through the well lit central office corridor, for those that linger on the edges too long tell tales of eyes glinting in the dark. I think this update is pretty much in line with what most expected, Norsca on schedule and lord packs as well. Norsca getting some updates to account for new races is a welcome addition. Part of me really hopes that the bird pictured is a Roc from Middle Eastern mythology. It's probably a Norsca or High Elf thing, and that's fine, but it'd be awesome if it turned out to be an Araby hint. Still leaves one significant unanswered question, imo. Late last year, they mentioned they were considering including unique start positions for the older lords alongside the Norsca reintroduction. Can we assume by the lack of mention here that is off the table? It would have been nice to see a confirmation one way or the other on this. No new information regarding Thrones and 3K. The only new thing about historical is New Campaign for Rome 2. Not really surprising as they mentioned that loads more Thrones info will be coming soon from some previewers and there will be an increase in CA info about the game. I presume the same with 3K. They are the two that are likely to see all the promotion in the next while. "You stumble about in darkness. There is no light here, no mercy. Naggarond has claimed the souls of better heroes than you." Yeah, next month will be all TOB all the time, most likely. No need for updates here. I expect a steady drip of 3K info will start a couple weeks out from TOB release, but likely nothing until then. Hopefully. To me it read like a lot of PR-speak. They said a whole lot of nothing. "We are considering thinking about this feature..."
Very excited to see they're still working on new content and updates for Rome 2! Whoa! New campaign for ROMEII ! With the love CA is giving Roman era, I believe Medieval era will get the same attention when it has been released. What do you think the Roman Campaign will be about? I hope it will be the Dacian Wars or a Teutoburg forest scenario. Make Surtha Ek playable pls!!!!!! The third Servile war would definitely be a interesting campaign. For the Bronze Age are you imagining something like a Trojan War scenario or something else? Still, these two can easily be their own title (traditional Total War game or Saga one like ToB).